Yellow Helmet For White Water Rafting Details Model: Kayak helmet Headlock Nylon+PP+PE+POM Shell: ABS Buckel: POM Color: lacquer painting Ring: Silicon Inner pad: molding soft EVA Inside label: fabric Strap: Nylon Packing: transparent bag individual ... Qingdao Stone Yacht Co., Ltd.
ST-FF420 Green Color Tubes Flying Fish Banana Boat With 0.9mm PVC Material Overview Product Name: Towable inflatable flying fish banana boat Material: durable PVC trapaulin Size: 6 seats Quantity: 1 Piece Flying fish is a new water game, extremely popular... Qingdao Stone Yacht Co., Ltd.
Yellow Color With Blue Decoration 380cm 0.9mm PVC Material Inflatable Banana Boat Detail Designed for fun in the sun on calm waters during spring and summer! 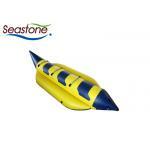 This banana boat requires under two minutes of inflation, suitable to carry 3 adults on board. ... Qingdao Stone Yacht Co., Ltd.
650cm Grey Orca866 Hypalon Material 1.2mm Inflatable Catamaran Boat Detail For this catamaran boat ST-SGS650, there is many functions, fishing or water pleasure with family or friends is a good choice. 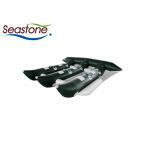 You can choose hydraulic steering system and enjoy ... Qingdao Stone Yacht Co., Ltd.
White Color 1.2mm PVC Material 450cm Inflatable Catamaran Boat Detail ST-SGS450 is with white 1.2mm PVC material, aluminium transom, heavy duty aluminum floor. Sleek lines, high performance, light in weight and fully portable, our inflatable catamaran ... Qingdao Stone Yacht Co., Ltd.